A second-half goal from Katie Stengel proved to be the decider at Rio Tinto Stadium as Utah Royals FC beat the Washington Spirit 1-0 in Wednesday’s Week 20 opener. The result sees Utah improve to 7-6-7 on the season. With the playoff race in full swing in the middle of the table, the critical three points bring Utah to 28 points in the standings, tied with the fifth-place Chicago Red Stars and just one removed from fourth-place Portland Thorns FC. For the Washington Spirit, the loss marks their seventh straight defeat. The Spirit now have longest active losing streak and the longest losing streak in the league this season. The Spirit’s last point came in their scoreless draw with Seattle Reign FC on June 16. The Spirit are winless in their last 11 games and last earned a victory against Sky Blue FC on May 23. The Spirit have been shutout in nine of their last ten matches, and are now 2-14-4 on the year, with 10 points. Many of Utah’s chances in front of goal were kept at bay by Spirit goalkeeper Aubrey Bledsoe, who made seven saves over the course of the match. In the 74th minute, Utah midfielder Taylor Lytle played a low ball in toward the box and Diana Matheson set up the play with a dummy, just minutes after both players had taken the field. Stengel ran onto the ball and was able to find the back of the net for the winner and her fifth goal of the season. Stengel also scored the late game-winning goal on Sunday night in Utah’s 2-1 win over Houston. Stengel and Christen Press led the Utah front line in shots on the night, with five each, and the duo began creating chances in the first half. Stengel tested Bledsoe early on with a quick turn and shot from beyond the 18 after running onto a ball from Press. The Spirit keeper dove to push the shot away and keep things scoreless. The Spirit put pressure on Utah with a cross in the 19th minute. The threatening delivery from Ashley Hatch found its way to Mallory Pugh, but her header went out for a corner. Pugh returned to the Spirit lineup against the Reign on Sunday after recovering from a PCL sprain. On Wednesday, the Spirit forward logged 30 minutes before making way for Cali Farquharson. In the 26th minute, Stengel ripped another shot from range, but Bledsoe followed it closely, diving to protect her left post and collect the shot after it bobbled. Press and Erika Tymrak combined for a pair of chances for Utah Royals FC in the 28th minute. Press took a solo dribble up from midfield and had a shot on goal that Bledsoe punched upwards. Tymrak was there to run onto the rebound, but her header sent the ball just wide of the post. Ahead of the second half, Spirit midfielder Rose Lavelle came off for Meggie Dougherty Howard. Lavelle earned her second start of the season on the night. In the second half, the Spirit looked dangerous in front of Utah’s net when Andi Sullivan sent a long cross toward the far post, but the ball went unanswered and trickled out for a throw-in. 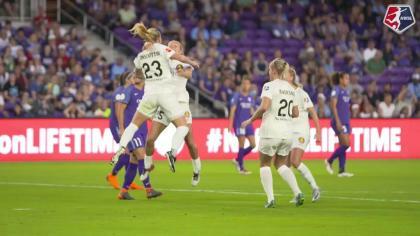 In the 62nd minute, Amy Rodriguez maneuvered through the Spirit defense, found a pocket of space, turned, and struck a shot in the direction of the goal but sent it just wide. Rodriguez had four shots on the night. In the 79th minute, Becky Sauerbrunn entered the match after being substituted in for Press. The exchange marked Sauerbrunn’s first-ever substitution into or out of a match in her NWSL career. Utah’s chances didn’t stop with Stengel’s go-ahead goal. In the 81st minute, Bledsoe got tested from distance again when Lo’eau LaBonta ripped a shot from far beyond the box, but the Spirit keeper got into position to punch it over the bar. A late effort from the Spirit came in the 92nd minute. A combination between Taylor Smith and Mallory Eubanks was almost enough for the equalizer, Rachel Corsie got in front of the ball with a sliding block that ended the chance. Utah Royals FC will face the Seattle Reign on Saturday. The Spirit have a break over the weekend but return to action against the Houston Dash on the road next Friday, August 17. Match ends, Utah Royals 1, Washington Spirit 0. Second Half ends, Utah Royals 1, Washington Spirit 0. Attempt blocked. Taylor Smith (Washington Spirit) right footed shot from the centre of the box is blocked. Assisted by Mallory Eubanks. Delay in match Ashley Hatch (Washington Spirit) because of an injury. Attempt saved. Katie Stengel (Utah Royals) left footed shot from the left side of the box is saved in the top centre of the goal. Attempt missed. Whitney Church (Washington Spirit) right footed shot from outside the box misses to the right. Attempt missed. Gunnhildur Yrsa Jonsdottir (Utah Royals) header from very close range is close, but misses to the left. Assisted by Sidney Miramontez with a cross following a corner. Corner, Utah Royals. Conceded by Aubrey Bledsoe. Attempt saved. Lo'eau LaBonta (Utah Royals) right footed shot from outside the box is saved in the top right corner. Corner, Utah Royals. Conceded by Taylor Smith. Substitution, Utah Royals. Becky Sauerbrunn replaces Christen Press. Attempt saved. Christen Press (Utah Royals) left footed shot from the left side of the box is saved in the bottom right corner. Assisted by Sidney Miramontez. Goal! Utah Royals 1, Washington Spirit 0. Katie Stengel (Utah Royals) right footed shot from the centre of the box to the bottom left corner. Assisted by Taylor Lytle. Substitution, Washington Spirit. Caprice Dydasco replaces Cali Farquharson. Substitution, Utah Royals. Diana Matheson replaces Amy Rodriguez. Attempt blocked. Katie Stengel (Utah Royals) right footed shot from outside the box is blocked. Attempt saved. Amy Rodriguez (Utah Royals) left footed shot from outside the box is saved in the centre of the goal. Assisted by Taylor Lytle. Attempt missed. Katie Stengel (Utah Royals) left footed shot from outside the box misses to the left. Assisted by Sidney Miramontez. Attempt saved. Christen Press (Utah Royals) right footed shot from outside the box is saved in the centre of the goal. Assisted by Taylor Lytle. Attempt missed. Meggie Dougherty Howard (Washington Spirit) header from the right side of the box is close, but misses to the left. Assisted by Ashley Hatch. Attempt blocked. Amy Rodriguez (Utah Royals) left footed shot from the left side of the box is blocked. Assisted by Katie Stengel. Attempt missed. Andi Sullivan (Washington Spirit) right footed shot from outside the box is close, but misses to the left. Assisted by Meggie Dougherty Howard. Corner, Utah Royals. Conceded by Estelle Johnson. Corner, Utah Royals. Conceded by Tori Huster. Foul by Cali Farquharson (Washington Spirit). Second Half begins Utah Royals 0, Washington Spirit 0. Substitution, Washington Spirit. Meggie Dougherty Howard replaces Rose Lavelle. First Half ends, Utah Royals 0, Washington Spirit 0. Lo'eau LaBonta (Utah Royals) wins a free kick in the attacking half. Attempt missed. Mallory Eubanks (Washington Spirit) right footed shot from outside the box is too high. Assisted by Cali Farquharson. Substitution, Washington Spirit. Cali Farquharson replaces Mallory Pugh. Attempt missed. Erika Tymrak (Utah Royals) header from the centre of the box is close, but misses to the right. Attempt saved. Christen Press (Utah Royals) right footed shot from the right side of the box is saved in the top centre of the goal. Assisted by Katie Stengel. Attempt saved. Katie Stengel (Utah Royals) right footed shot from outside the box is saved in the bottom right corner. Assisted by Sidney Miramontez. Attempt blocked. Christen Press (Utah Royals) left footed shot from the centre of the box is blocked. Assisted by Erika Tymrak. Attempt missed. Sidney Miramontez (Utah Royals) left footed shot from outside the box is close, but misses to the left. Assisted by Erika Tymrak. Corner, Washington Spirit. Conceded by Samantha Johnson. Attempt blocked. 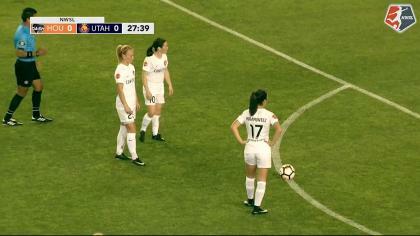 Amy Rodriguez (Utah Royals) left footed shot from the centre of the box is blocked. Assisted by Katie Stengel. Offside, Washington Spirit. Rose Lavelle tries a through ball, but Ashley Hatch is caught offside. Attempt blocked. Mallory Pugh (Washington Spirit) left footed shot from the left side of the box is blocked. Assisted by Mallory Eubanks. Attempt missed. Samantha Johnson (Utah Royals) header from the centre of the box is close, but misses the top left corner. Assisted by Sidney Miramontez with a cross following a corner. Attempt saved. Katie Stengel (Utah Royals) left footed shot from outside the box is saved in the top left corner. Assisted by Christen Press. Attempt blocked. Ashley Hatch (Washington Spirit) left footed shot from outside the box is blocked. Assisted by Rose Lavelle. Attempt missed. Amy Rodriguez (Utah Royals) left footed shot from outside the box is too high. Assisted by Rebecca Moros. Attempt blocked. Christen Press (Utah Royals) left footed shot from outside the box is blocked. Assisted by Sidney Miramontez.